A cystectomy is surgery to remove the bladder. Sometimes other organs are also removed. After your doctor removes your bladder, he or she makes a new way for you to pass urine. This is called an ileal conduit (say "ILL-ee-ul KON-doo-ut"). It's made from a piece of your intestine. One end connects to your ureters. 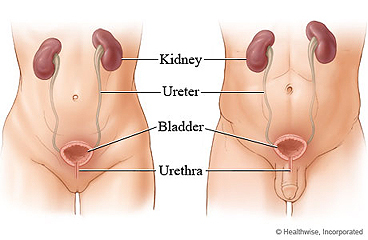 These are the tubes that carry urine from the kidneys to the bladder. The other end connects to an opening the doctor makes in the skin of your lower belly. This is called a urostomy, or a stoma. After the surgery, urine will pass out of your body through the stoma and into a plastic bag. A nurse with special training will teach you how to care for your stoma. Most people go home 1 to 2 weeks after the surgery. To fully recover, you will probably need 6 to 8 weeks. Surgery to remove your bladder will not affect your sexual or reproductive life. But if a woman also has her uterus and ovaries removed, she will not be able to get pregnant. She could also start menopause and have hot flashes or other symptoms of menopause. And if a man has his prostate gland and seminal vesicles removed, he may have problems getting an erection. He will also not be able to get a woman pregnant. If you are a man who may want to father a child in the future, talk to your doctor. There are ways to save your sperm before the surgery. You may have a small plastic tube coming out of your stoma. It helps drain urine into a small bag. Enter G712 in the search box to learn more about "Cystectomy With Ileal Conduit: Before Your Surgery".